Exposed: “Fitness Photos” Are Fake! 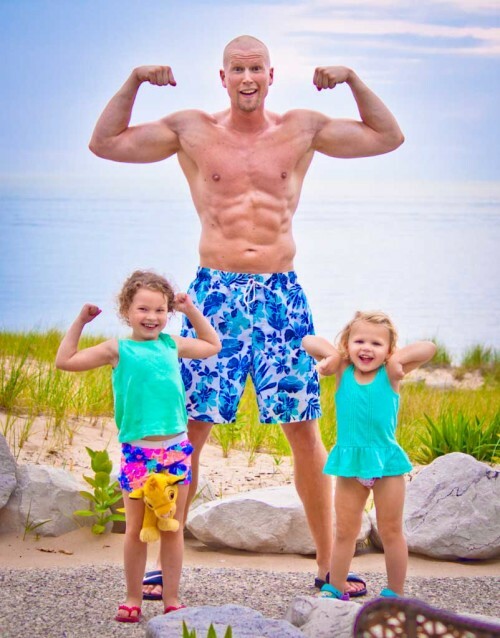 Jason is a coach and algebra teacher devoted to bringing quality fitness education and coaching to the everyman. Founder of Anyman Fitness, Jason uses his mathematical background to help clients acheive their goals. Want to train with Jason? We can hook you up. I recently did something I have wanted to do for a very long time. I was nearing the end of a long cut and I am currently the leanest I’ve been in a while. So, as a treat, I decided to get some “fitness pictures” taken by a professional. My photographer’s name was Stephanie and she did excellent work. She was able to shoot on location in Grand Haven, Michigan during a family vacation. We had rented out a house directly on the beach of Lake Michigan, and we took shots inside the house and outside by the beach. I was extremely pleased with the finished work. 1. Scheduling the session gave me some extrinsic motivation and kept me on point with my diet and training. I’m not a powerlifter, I don’t participate in “fun runs”, and I have no desire to hit the stage in a bodybuilding contest. At the same time, a photo shoot like this would give me a goal to aim for. I also thought the pictures would be nice as a “keepsake”. When I’m in a nursing home one day, I’ll have those photos to show the unfortunate souls who are assigned to give me sponge baths. 2. The pictures will be useful for my online business. As a coach, you should be able to walk the walk. While knowledge and your own personal look don’t always match up, it’s been said a coach’s physique is their business card. I wanted my business card to be impressive and well-polished. No more “selfie stick shots” on social media and websites. 3. I thought it would be fun. This needs no explanation. I thought it would be a good time and a learning experience. I’m not really into “things”, but I love “experiences”. So, I ponied up the loot and made the appointment. But there was one HUGE problem. Shen I got the pictures back… I couldn’t shake the feeling… that they didn’t really look like me. In a strange sort of false reality, I looked at the pictures over and over again. I liked what I saw… but it felt like I was looking at someone else in the pictures. They seriously didn’t look like me! You might THINK these pictures are me, and while I promise you I was present when they were taken, below is how REGULAR me looks. The following picture was snapped just a few days after the above pictures. No lie. Straight up truth. This is me, shortly after breakfast just a few days after the fitness shoot. Sorry to burst your bubble, but that doesn’t look like me, either. That’s a bit different, eh? Possibly my favorite pictures from the shoot are the “side abdominal/oblique” pictures. I think I see an ab or two. Can you? The revealing of my actual, natural physique isn’t meant to discredit any of the hard work I did, or shortchange the awesome work Stephanie did. I would highly recommend her to anyone. Too much holiday cheer – 268 and > 20% BF. When it was time to cut the fat, the prospects of going at this alone seemed daunting. I called on a few buddies to help. 1. I hired my own coach in order to keep me accountable. Paying someone to tell you what to do is one of the easiest ways to free your mind and stop “paralysis by analysis.” I took full advantage of this and hired Andy Morgan for the purposes of accountability and mental clarity. 2. I worked hard on my mindset. I made sure to re-frame difficult situations and actively attempted to minimize stressors in my life. 3. I hit my macros damn near every day for 8 months. I took 3 days off for a fishing trip, 1 day off for a friend’s engagement party, and the 4th of July off. Other than that, I nailed macros every day for 8 straight months. That’s a 97.9% success rate over 8 months. 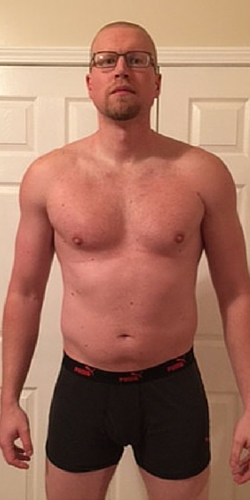 I was rewarded with 40 pounds of fat loss. 4. I didn’t miss a single training session. Monday, Wednesday, Friday – for 7 solid months. 5. I asked friends – friends who had done fitness photoshoots before – to give me a few pointers. Namely, Bryan Krahn and Mike Vacanti. They both had a few “prep” pointers. Nothing too crazy. Just a few, simple tricks to throw into your training, your diet, or the few days leading up to and/or the morning of the shoot. Thanks for the tips, men. 6. I did not feel well when these pictures were taken. I was cranky, tired, and lethargic. The pictures were taken at 7:30 at night. I had eaten a few, small meals of 25 g of protein and a piece of fruit during the day, less than 500 calories. I had barely sipped on water – just enough to wet my mouth. I was dehydrated from the travel as these were taken after we had driven 4 hours to our destination. I also spent a good 20-25 minutes “pumping up.” I estimate around 500 push-ups and 100 pull-ups to get the physique looking good and the abs popping. The slight dehydration, the small amount of food, and the nice pump gave me a very aesthetic look for the pictures. 7. The pictures were then filtered and touched up. Lighting and angles are everything. Cuts appear deeper, muscles appear fuller, and the physique starts to “pop” under the right lens. My photographer didn’t “Justin Bieber” these pictures – they are totally me, we didn’t go that far. At the same time, we did everything under our control to take care of variables which would give us the best possible end product. When all of these items were combined, the pictures ended up looking really damn good. While the look in photoshoots is attainable – if only for a brief moment in time – it’s not maintainable 24/7. Not only did my condition take 8 months’ worth of extreme dedication to accomplish it, I had to dehydrate myself and eat next to nothing for 24 hours in order to dry out and an hour to pump back up. The actual condition I was in during the exact moments the pictures were taken is a fabrication. You can’t look like that full time – at least not if you want to be healthy. I used to idolize fitness coaches. I looked at their pictures and yearned to “look like that.” I desired the “superhero” physique – the defined 6-pack, thick pecs, broad shoulders, and bulging yoke. Ironically, now that I am a fitness coach, I’m happier with my body as a constant work in progress and I don’t need the validation of these pictures. I do still spend much of my life dedicated to making incremental physical improvements. I have, however, gotten much smarter in regards to what is naturally possible, and what isn’t. Everyone looked lean and healthy, but nobody looked like they did in their respective “fitness pictures” they had posted on their websites and social media. Those conditions are created in order to make money. Be sure check yourself if you are striving for an unreachable ideal. Never compare yourself to a glossy picture or an image on your computer screen. Take progress shots of yourself – and compare yourself to the old you ONLY. You can rest assured, the picture you are idolizing is never a maintainable possibility. **Editor’s Note – Two days after this article was originally published on my site, I was contacted by Men’s Health. They republished it on their site on 8/20/15. Look for it here.